I arrived at Heathrow Terminal 5 at 1330 for my 1530 departure on BA0089 to Chengdu, and after having my Chinese visa checked at the desk walked to Fast Track. This was anything but, and it took almost 15 minutes to clear security. Normally, I would then have made the trek down the escalators and then back up to the lounge, but for this inaugural flight for invited members of the media we were allowed into the Concorde Lounge, accessing through the door immediately to the right of the fast track security. There was then a reception on the terrace of the Concorde Lounge until the flight was boarding. 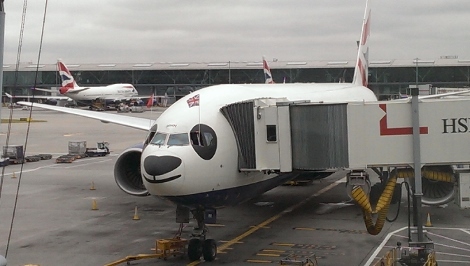 We boarded from the main terminal, and since this was the inaugural flight there were few passengers ahead of us and we were quickly onboard, stopping only to take pictures of the nose of the B777 which had been painted with a panda’s face to celebrate the new route launch. Once on board I found my seat, had my jacket taken, and was offered a drink, either alcoholic or non-alcoholic (water, juice or champagne). The pilot told us that this would be a relatively short flight, less than nine hours, which surprised me (favourable winds, I think). Although this was the inaugural, we were on a standard four-class (economy, premium economy, business and first) B777-200 aircraft. To see a seatplan, click here. I was in seat 11K, a backward facing window seat, which I prefer since I would rather step over someone’s feet in the aisle than be stepped over, and because I don’t like the meal service being conducted over me while I work on my laptop. I find it easier to sleep in the window seats because they are more private. The best seat in this cabin, in my opinion, would be the window seats at the back of the cabin (15A and 15K), since you get all the advantages of a window seat, but have unimpeded access to the aisle. Shortly after take-off we were given our Elemis amenity bags with flight socks, ear plugs, eye mask, lip salve, moisturiser, hand and body lotion, eye gel and a facial wipe. The drinks came round soon afterwards, along with the menus, and the meal service began quickly, at least partly because although we had set off mid-afternoon — with the time change we would be landing in the morning in Chengdu, and needed time to sleep. I tried to watch a film on the inflight entertainment system but found that the screen was pixelated and the film would stop and then jump forward. This happened on a second film so I asked the flight attendant if they could reset my system, which they did, but to no avail. They were very apologetic and offered to let me swap seats, but since the inseat power was working fine for my laptop and I wanted to sleep I said I would stay where I was. After the meal service there was a chance for a 30-minute question and answer session with Willie Walsh, CEO of IAG, and then around 1930 (0130 destination time) I went to sleep for a little over four hours, having no trouble sleeping. I woke for the breakfast service. The breakfast menu began with chilled fruit juice, smoothie of plum and blueberry, and fresh frui; or west country granola with fruit compote and natural yoghurt. For the main course, there was the choice of either a traditional English breakfast of scrambled eggs, crispy streaky bacon, Saddleback sausage, grilled tomato and hash-brown potatoes; or a continental breakfast featuring Wiltshire ham and Milano salami with gruyere and Cornish Yarg cheese; or shrimp congee, smoked salmon and scrambled egg wrap with chive sauce. The staff were excellent, and when, as a joke, I was offered the option of hot milk with my coffee I said it would be great if in addition they could arrange for it to be a cappucino, and somehow this was managed. We arrived slightly early and had a water salute from four airport fire engines to welcome this first flight to Chengdu. Clearly not a normal service in many ways, but the flight attendants were excellent throughout, although obviously its disappointing that the IFE was faulty. To contribute to our Chengdu forum thread, click here.